Application list for Wi-Fi communication. This is the line specifies application(s) to communicate through Wi-Fi connection. With this indication, all the application(s) are able to communicate through Wi-Fi connection. With this indication, the same restrictions are set with cellular connection. With this indication, application(s) are set for Wi-Fi connection only. When Wi-Fi connected, apps specified here will be able to communicate in addition to those apps specified for cellular. 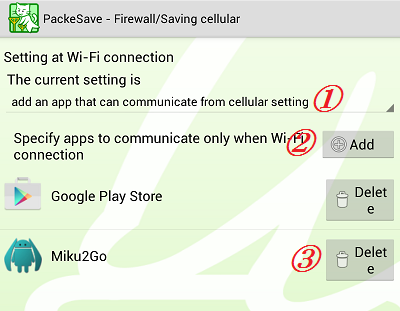 This is a menu to set operation for Wi-Fi connection. At the initial setting, a description [don't block anything] appears in the top part (1). in "The current setting is" line shown at the top part (1).